The theme at MMM is to show what we love to do. I recently learnt how to do faux leather backgrounds and I love doing them. This is a page I did for someone who shall remain nameless for the time being, as part of a round robin journal I'm involved in. It has several other techniques i love. 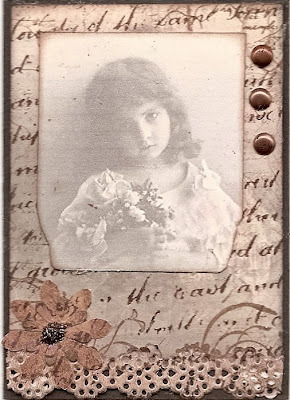 The little embellishment in the corner is stamped utee coloured with perfect pearls, the words are grungeboard, coloured with a mix of different inks and perfect pearls to give them a metal kind of effect. It may seem that there is only little stamping on here, but in fact there is. 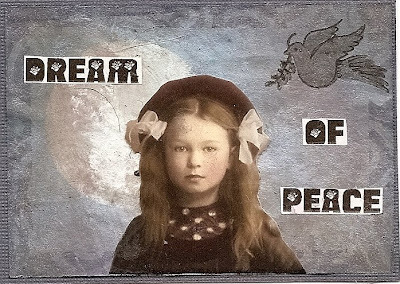 The little peace dove is a stamp and I also edged the ATC with a rollograph, though it's hard to see. May all our contributions and thoughts of peace while we were working, go towards making the dream of peace a reality!!! Think Monday Think ATC "Handwriting"
The theme at TMTA is handwriting. 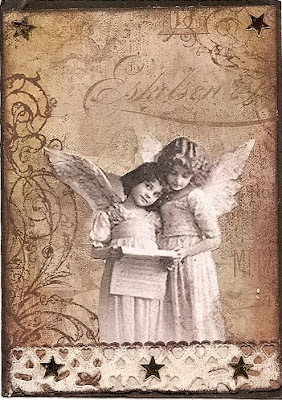 I love the vintage feel old handwriting lends to art creations. 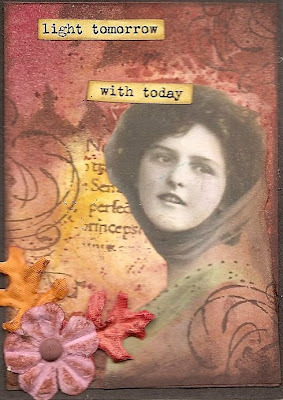 Anyway, here is the ATC I made. 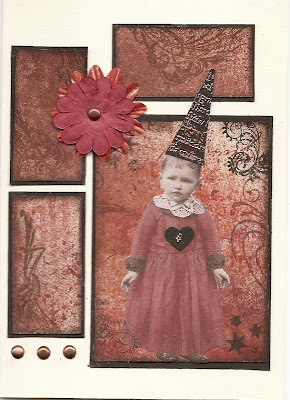 The theme at Sunday Postcard is "Flowers" this week. Not had much time to do this challenge in the last few weeks, but managed today, so here it is. The theme at Gothic Arches is time. 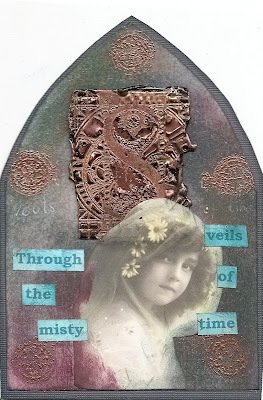 Here is my contibution, I called it "Through the misty veils of time"
The theme at TGIF is free today. 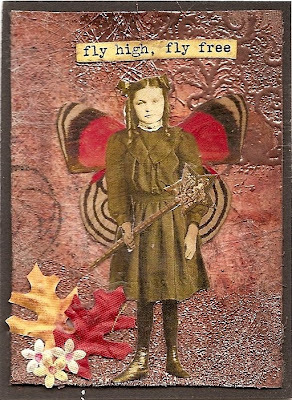 Decided to enter two ATCs which I just completed in an autumny mood. 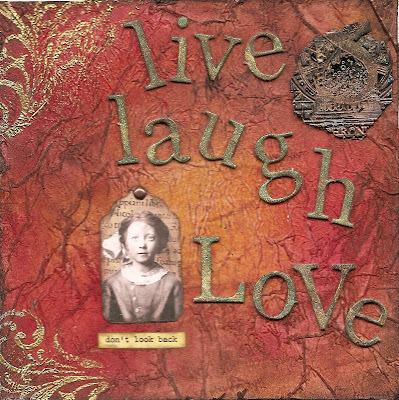 One of the images is from Lisa's altered art, the other I just had in my stash, can't remember from where. 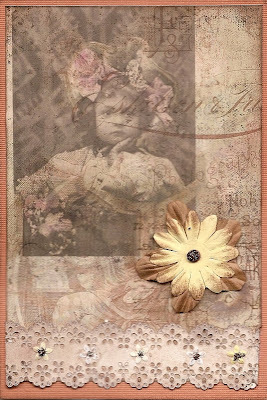 The litlle leaves and flowers i used as embellishments were given to me by Vintage Will, she is just soooo kind! The theme at MMM is Star. 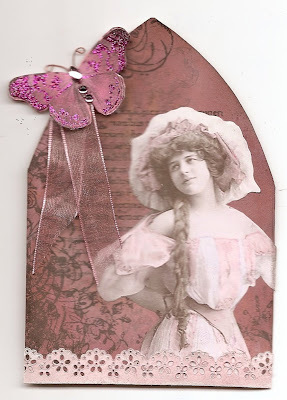 Here is my little contribution..
Gothic Arches "Pretty in Pink"
The theme at the new Gothic Arches site is Pretty in Pink. Pink is so NOT my colour, that's why it was a real challenge. When I found this image though, I felt a lot better. I thought this beautiful lady just suited the theme... Never had time to do it yesterday, so now I am a day late but I still wanted to give it a go. The new Gothic Arches site is wonderful! The theme at SaWo is Tissue this week. The idea was to create a background with the feel of old leather. 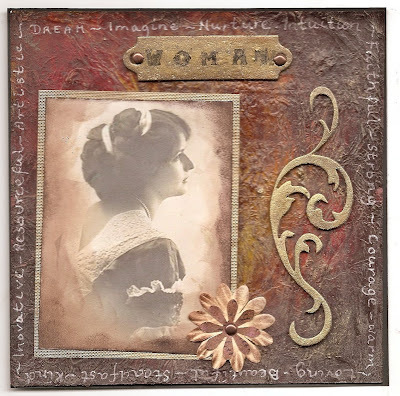 As it so happens, I had to do a journal page for Round Robin journal that I am involved in on the theme of Woman. I decided to combine the two and create my page with this particular technique. Around the edges I journalled some words and attributes that I associate with the theme of "Woman". I did not think about it much intellectually, i just let the words flow as they came into my mind in no particular sequence or order. 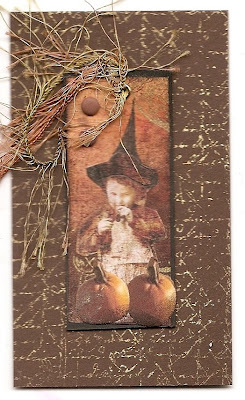 The embellishments are grungeboard coloured with a mixture of Perfect Pearls and pigment metallic ink. Make a Moo or Two "Pumpkins"
The theme at make a moo or two is pumpkins. I only managed one this week. Made it into a little tag. This week the challenge is Halloween. Not quite in the mood yet, but here is my contribution anyway.